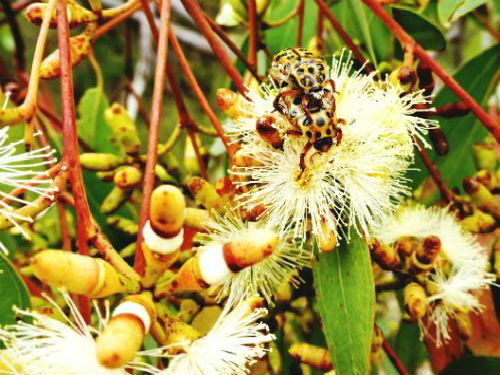 Eucalyptus prava, the Orange Gum, develops into a small to medium tree with a trunk that is often rather twisted. The bark is smooth and comes in a range of colours. Patchy grey, grey-brown, orange and red-brown are all colours in the palette of Orange Gum bark colours. In spring the bark is shed in large plates or flakes. This is when the orange colour is most vivid (hence the common name). As the year progresses this colour fades. Leaves are ovate-lanceolate, dark green above and paler beneath. Large white flowers, in clusters of 5-7, appear in late spring and summer. A range of insects are attracted to the nectar-rich blooms. Centre stage, in the photo, is a pair of Spotted Flower Chafer Beetles that are feeding on the nectar and endeavouring to increase the Spotted Flower Chafer population. The capsules that follow the flowers are globular with prominent protruding valves. E. prava occurs on the Northern Tablelands of NSW and south-east Queensland. The Orange Gum was previously included with E. bancroftii, a coastal species but was given species status in 1990. The species name is from the Latin; pravus meaning crooked and refers to the often twisted trunk.